By Tom Gregorio on Jan 3, 2014 - 26 Comments. 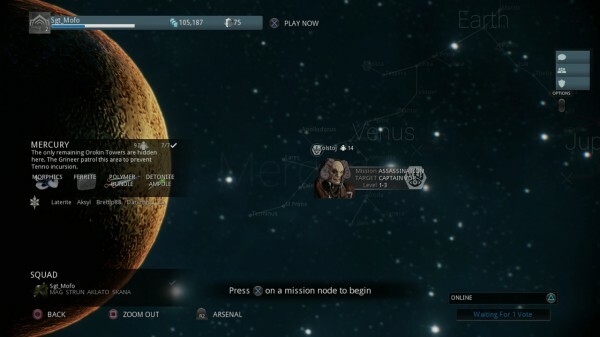 Warframe treads an area that hasn’t been throughly explored: the free-to-play console market. Instead of tacking on to the abundance of F2P MMO’s and MOBA’s out there, Warframe focuses on fast and frenetic third-person action. All missions (excluding the mastery tests) can be played co-operatively with up to three other players, and you don’t even need a PS+ subscription to get in on the action. Micro-transactions are completely optional since everything that isn’t purely cosmetic can be unlocked without spending real-world currency. All there really is to lose is some space on your hard drive and time to download the game client. Since cost isn’t a factor, the question remains: Is it worth your time? Or will players be seeking the uninstall button ASAP? Keys – Access the Clan Dojo and partake in secret missions. Market – Predominately geared towards those who purchase Titanium with real-world currency. Players who choose not to purchase Titanium can purchase a few ready made items as well as the blueprints they’ll need to construct their own equipment, weapons, and Warframes. Foundry – Construct gear here using blueprints purchases in the Market and materials obtained during missions. Missions are spread across multiple planets representing the solar system. As players progress, they’ll earn XP on their Warframe and weapons, both of which are capped at level 30. The story-based goal of each planet is for players to complete enough missions (or nodes) to get to the boss battle. Once the boss battle has been successfully completed, players can progress to the next connecting planet. Planet-specific bosses are not the only unique thing that distinguishes planets from one another. There are 4 materials that can be found on each planet that can be used to complete blueprints. This is important for players who are opting to not purchase Titanium with real-world money. Players who want new gear and Warframes will need to grind missions repeatedly in order to obtain pertinent materials. Players will be tasked with over 10 different mission types throughout the game. The objectives in each mission type help keep the game fresh. ‘Mobile Defense’ will require players to coordinate as they transport several datamasses to computer terminals. Any player carrying a datamass is restricted from using their primary weapon. Although players have the option to drop the datamass, this is typically inadvisable as players will want to stay mobile going up against heavy enemy resistance. ‘Survival’ has players seeking out life support modules as they make their way to extraction. Time is of the essence in ‘Survival’ so players won’t want to spend too much time fending off enemies as they progress towards subsequent life support modules. Combat is a mix of guns and melee attacks. Players can outfit themselves with automatics, shotguns, and akimbo pistols as well as katanas, daggers, and dual heat swords to name a few. The controls for the shooting handle gracefully. ADS and auto-aim help make acquiring targets hassle-free. Anyone who has played Gears of War should feel right at home. Melee combat is a bit clumsy, but ultimately feels gratifying. Free-aim in Warframe tends to be a bit loose and has a healthy dose of aim acceleration applied to it. For Warframes with melee abilities, the controls are easier to overcome. If a player connects with a melee strike, the camera doesn’t focus on the enemy being attacked resulting in players having to fight the controls as much as the enemy. There are subtleties that can make melee more manageable, such as making sure to not be sprinting in order to correct your aim easier. Despite the melee combat’s shortcomings, it can still prove to be enjoyable. Warframe’s impressive particle effects are on display, as each strike emits sparks in every direction. Dismemberment is present too and, while it might not be to the same extreme as Gears of War, you’ll still be able to lop off arms and slice torsos without breaking a sweat. There are a lot of mechanics that encourage players to stick together during missions. If you lose all your health, you will enter into a downed state. Don’t worry, you can’t be curb stomped, but it does trigger a bleed out timer. The only way to not bleed out is for other players to revive you. Unless you want to use a valuable revive token (you get four per day), sticking with fellow players is the best option. Loot drops are also specific to each player’s game world, so you don’t have to worry about anyone stealing valuable loot. Each level is uniquely generated so subsequent playthroughs may not play exactly the same. For example, a seemingly innocuous room the first time might trigger a security lockdown the next time, flooding you with dozens of enemies. Security lockdowns can also lead to players being split in two different rooms making the enemy onslaught even more difficult. The choice then is to find the console to disable the lock and rejoin your teammates or try to fight your way through the wave of enemies. During the midst of some Battlefield 4 server downtime, don’t hesitate to check out Warframe. The game is free for all players, and unless you need instant gratification, money is completely optional. Warframe also fills the current void on PS4 for a third-person action title. If you want a game that blends action elements from Gears of War and character progression elements from Mass Effect, then join the community and download the game here. If you need help getting your bearings, check out the community run and thoroughly detailed Warframe Wiki.